I can’t honestly say riding along the coast of Washington and Oregon on a Harley was ever on my bucket list, but along about March of this year it struck us as a pretty good idea. And that’s how it turned out to be, as Ellen and Reid found out last week. This was the entire reason for the trip. 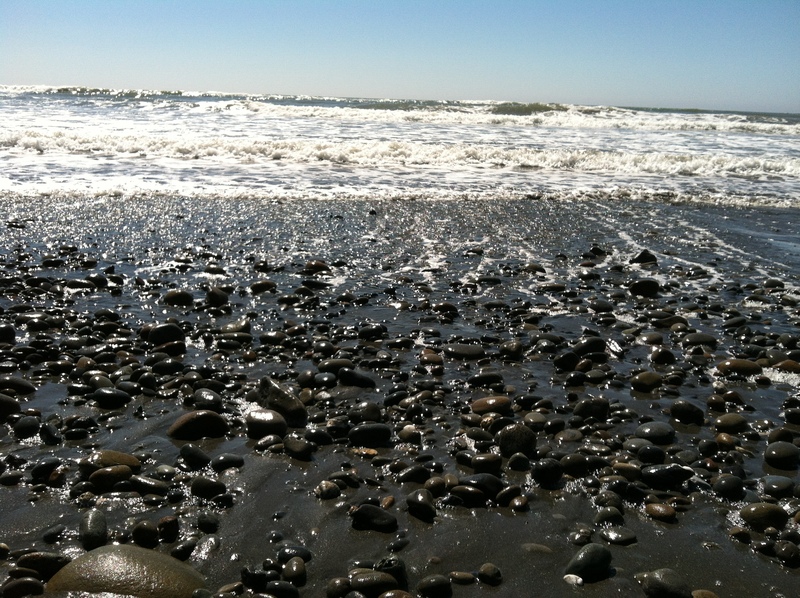 Cruise the coast, stopping when we saw something good – just like this scene at Ruby Beach, Washington. Ellen/Reid: To say it was rugged getting up this morning is a major understatement. I couldn’t believe it when the clock read 5:10. I could’ve stayed in bed for another hour, easy. It was just so hard to roll out of the sack. I waded through 243 work emails yesterday so that made the transition to the morning work a little bit easier, but not by a whole lot. It was a good week in Washington and Oregon. We had Chamber of Commerce weather the entire ride. Sunny every single day. Our early mornings along the coast were cold and the marine layer had to burn off before we got into any real sunshine. 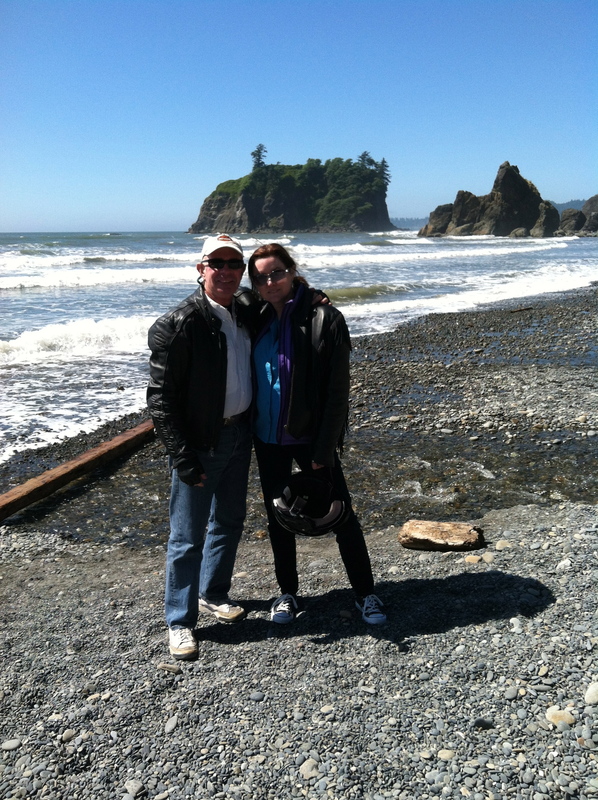 The leathers didn’t come off much on the trip…cool for us North Carolinians, but warm by Washington and Oregon standards. 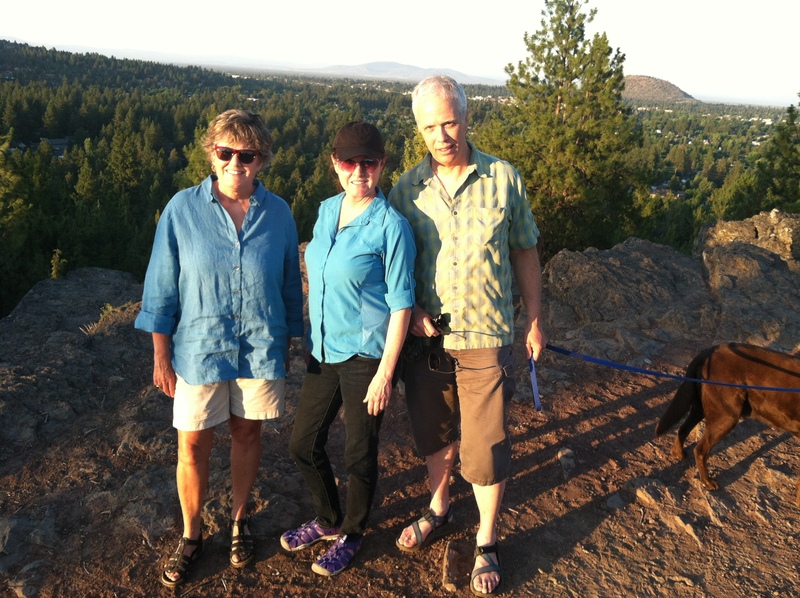 Our friends Sue and Rand Hammond in Bend, Oregon. If there is a more well-rounded, cooler community than Bend, please, tell me where it is. Sue said for every job posting there are 100 qualified job applicants. They continue to make a go of Thin Book Publishing. Ellen, tell Tim we rode alongside the broad and expansive Umpqua River just as anglers were trying to catch steelheads. Wish we could have dipped a line in there. From Bend we rode Route 20 to Salem, the capitol to stay with my cousin Tom and his wife Jessica. 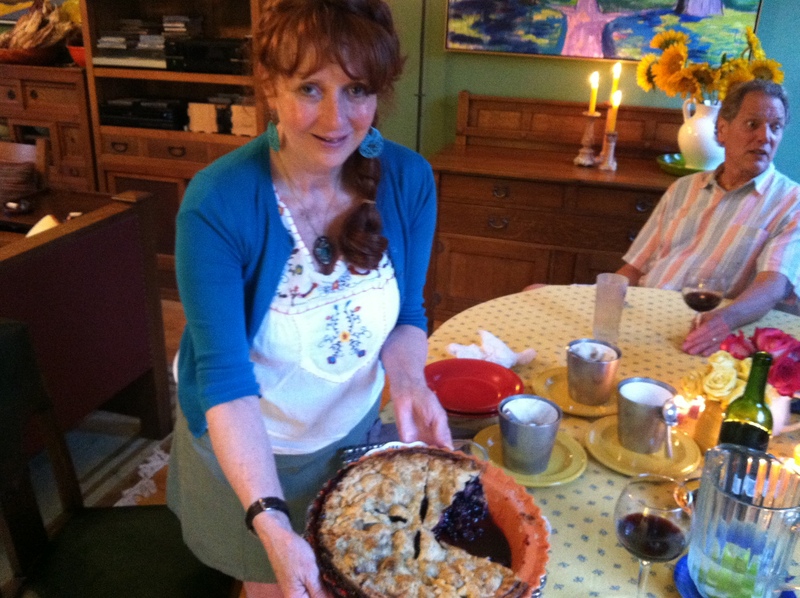 Jessica, a writer for Gourmet among other noted magazines, served an incredible meal, virtually all of it local products. They’ve got a good spot, too, near a big park and not overly far from the statehouse and such. She’s a prolific author under her own name, Jessica Maxwell, and Tom is doing pretty wellin the legal trade, having gone into private practice from working for the state. It was great to see them. They are literal world travelers. We took a fairly pedestrian path up I-5 to Portland to see my aunt Mary, and Tom’s sons Ben and Eli. They’re doing pretty well, too. If there was ever a rugged individualist and adventurer, it’s Tom’s son, Eli Andersen. Try hand paddling on your belly the length of Vancouver Island, one of his many solo adventures. Eli gives Felicia the scoop on the board he hand-crafted for his trip. 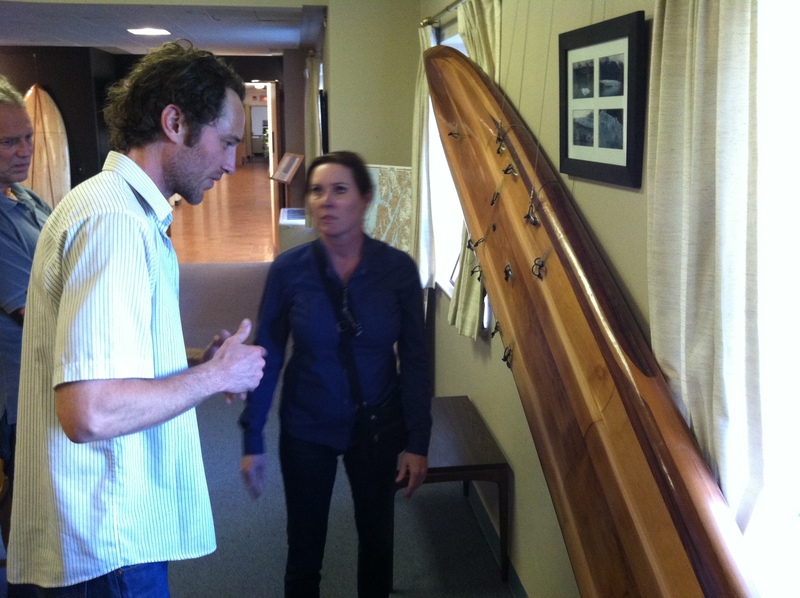 Eli showed us his hand crafted board he used to paddle down the west coast of Vancouver Island. We had a nice dinner at Mary’s place, then got back on the bike for another 60 miles or so just across the Columbia River into Washington. The next morning was more of the same pedestrian (I-5) route up to Seattle. We were going to make an off road pass by Mount St. Helens but the morning clouds had yet to burn off and there wasn’t much to see. And by that time anyway we were mostly fried and tired of sitting on the bike. We returned it back to the Harley dealer about 1 p.m., then headed to downtown Seattle in a rental car. I was just exhausted. The bike demands constant attention, and once you’re off it there is a noticeable letdown. I came this close to snoozing at lunch. If the truth be told, this was each day’s reward. 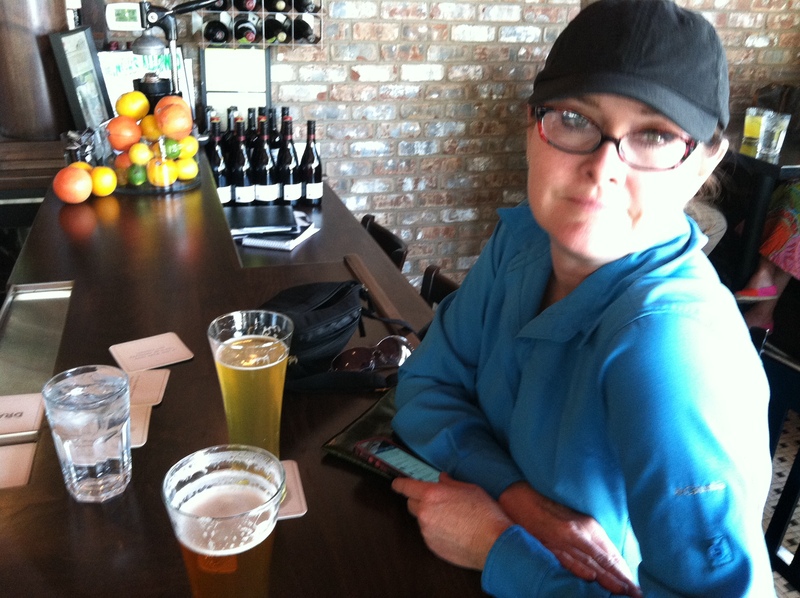 A stop at some wayside place (this was in downtown Bend) for a cold one and just plain relaxing. We found some fleabag no-tell/motel near the airport and called it a night until the time for our flight home. I suppose it’s always good to get home, and in truth that was just about enough Harley riding for me for awhile. 1,472 miles doesn’t sound like a lot but it was plenty of road time at this stage of the game. The oath was not to overly push it, and other than the first day we lived up to that. There wasn’t a lot of angst turning in the keys. Hey, next summer it’s hiking in Wyoming. One week you’re prepping for vacation. The week after, you’re wondering where the hell the time went. So it goes. The letter here was the final get-ready-to-rumble note to Ellen and Reid as preparations finalized for the ride along the Washington-Oregon coast. More copy and pics next week. Ellen/Reid: It doesn’t look as if much has changed up in Cass Lake; people still having fun in and around the water and the mosquitoes don’t seem to have abated much. Emma did look so happy to be up there. But that picture of the spider on the door frame – a wolf spider, as near as can be determined – was something else. That was a thing of monster movies. It has to be unbelievably voracious. You don’t get that hideously huge by nibbling on gnats. 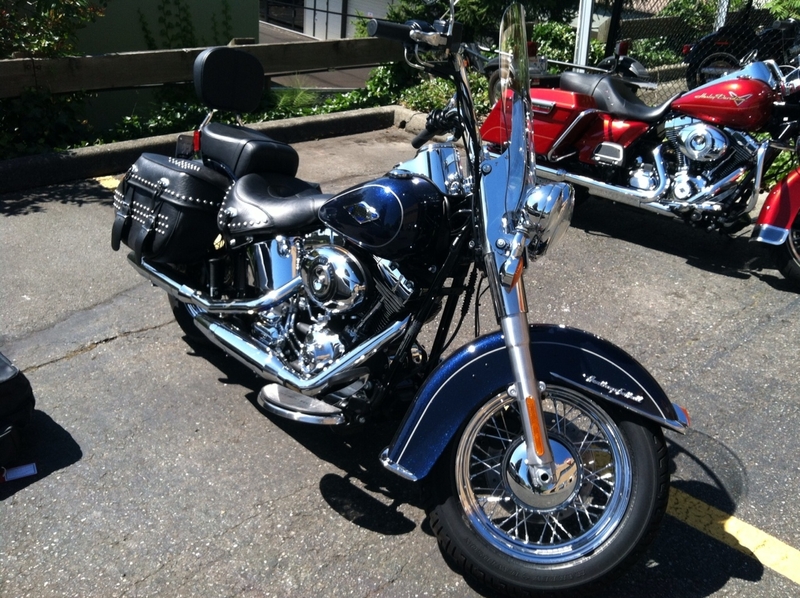 The Heritage Softail at Eastside Harley Davidson in Bellevue, WA. Not as Harley-ish loud as some Vance & Hines pipes, but seven days and 1,452 miles later, it was returned to the same spot. Reid, I’m sorry I didn’t get to talk to you on your birthday. Minnesota isn’t such a bad place to be on the 4th, and the 5th will always be tied to that holiday. Here’s a little something for you to either semi-splurge on yourself or take Liz to a nice dinner. You have to tell me how you and Tim did on the rivers. How come we never trout fished up there? The apple doesn’t fall far from the tree; Ellen will hit the bricks for a half marathon in the fall. A big chunk of her training, it would seem, is trying to keep pace with Emma. Ellen/Reid: I’m getting too old, or maybe too out of shape, to walk golf courses anymore. It was really hot Saturday and while I tried to stay hydrated for every ounce of fluid ingested another two ounces exited through my pores. By the time I got home I was just exhausted. Felicia finds it frustrating because she’s ready to go and I’m becoming one with the couch. But at least the stroll is better than not working out at all. A buddy of mine and I walked Sunday, too, but after nine holes we gave it up in stifling humidity and surrendered to the luxury of a cart. Good thing, too: the skies opened up with a few holes to go and there was enough lightning to power a city. Well, Reid, the mighty Black Hawks pulled it out in near miraculous style. Incredible. The paper the next day showed revelers on West Division Street which couldn’t have been much more than a stones throw from Liz and you. Hockey is such a good, fast moving, fun game to watch. Hard to figure why more people don’t enjoy it. The NFL is far too pokey; waaaay too many stoppages for replays and the like. That’s what’s wrong with democracy in U.S. sport. We have to adjudicate too many things because the technology exists to make sure someone’s toes were in bounds or someone didn’t hedge at the line of scrimmage. That’s way too stupid. Plus, as we’re finding out the hard way, lots of players are just thugs. No getting around it. Here’s hoping Cass Lake was good all the way around. 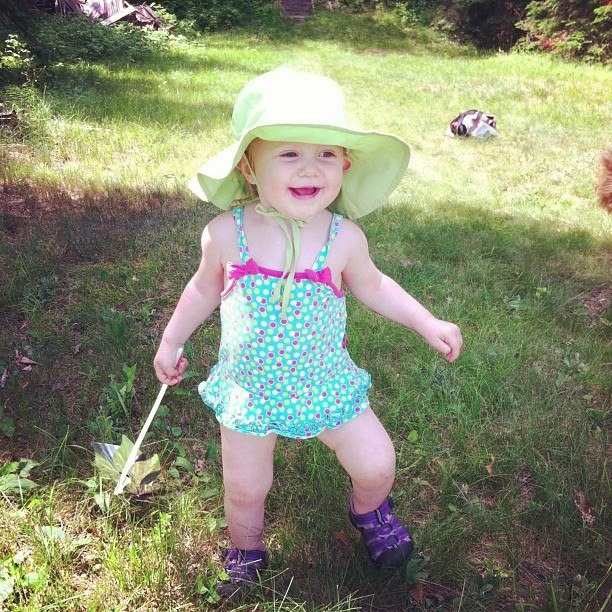 Star Island at Cass Lake, MN is a lake country nirvana for little Emma, as it was for her mother and uncle before her. 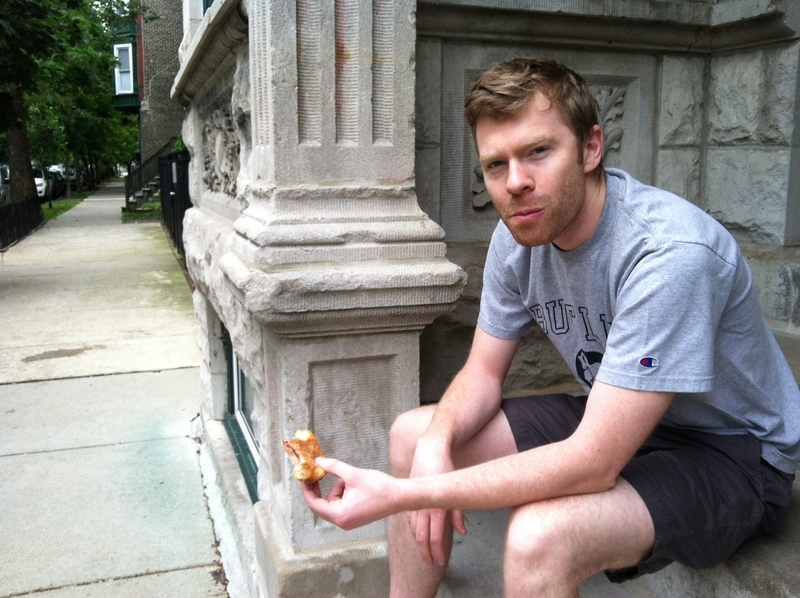 Reid polishing off a danish on the stoop of his Chicago apartment early on a Saturday morning. He seems in a good place. act like that. That won’t happen again. I know I was plenty anxious about today but there’s still no excuse. Reid, I was so impressed with how you and Liz have done your place. It’s just awfully nice. And incredibly spacious. I didn’t sleep very well last night, tossing and turning about today’s examination. You two will be the first to know (after Felicia) and by the time you get this the results should be in. So we’ll just keep our collective fingers crossed. We’ll know, too, about the Blackhawks. That was fun watching the game. I didn’t realize you guys were so into hockey. Who would have known? The morning got off slowly at work. Not even the black coffee was able to shake things up this a.m. Maybe it’s just one of those days. For the third time United has changed our flight plans to Seattle. This is getting old. In three weeks we’ll be there and you guys will have been to Cass Lake and back in that time. You should have a lot of fun up there. Emma is old enough to sort of get the drift of things up there. A new generation attaches itself to Northern Minnesota. Felicia harvested our first tomatoes of the season from the front stoop and they have been pronounced edible. I got one bite and it was pretty good. Reid, you ought to stuff some herbs for cooking in those boxes at the top of the stairs. A little basil, some oregano, cilantro, chives, et al. That would be a nice little garden. Whatever you’d plunk into the dirt would need plenty of water since the boxes are facing south but that’s okay. Nothing wrong with some common herbs. I should ship you some cuttings from the oregano here since I brought it back from your grandmother’s garden. That would be a good way to keep that legacy going. Little fledged cardinals continue to troop to the feeder. I worry they won’t know how to feed themselves in the wild if we pull the plug on the sunflower seed. But we enjoy them flocking to the second floor and it makes them a little safer from the marauding feral cats that I see slunking around here on a daily basis. I never should have sold your grandfather’s .22. My BB gun is just enough to catch their attention although I’ve never sent any ammo their way. My church newsletter was done just in time before boarding the flight to Chicago. But it’s a beast that needs to be fed all the time. I’ll have to crank out another one before heading to Seattle. It just never goes away but such are the wages of sin. I’m trying to get a little more inventive and creative on the graphic design but you guys will have to be the judge. It’s still outside my comfort zone. Alright, enough already. Take the sunscreen and Coolibar clothing with you to Cass Lake. Reid, I hope you catch fish, and Ellen, I hope you catch Emma. She’ll be trying to scoot away all the time.